During the period, 1770 to about 1870, seven Irish born classical musicians and performers emerged on the concert stages and in the salons and opera houses in Europe, Russia, America, Canada, Australia and elsewhere with great success. What differentiates these seven individuals from other Irish born musicians of the period is the fact that each of them achieved great fame internationally. Their success was not only in Britain but also in foreign countries where they were often the sole Irish born representative in a musical environment that was generally dominated by either Italian, French or German artists along with some other nationalities. There were occasions when the careers of some of these individuals crossed on the international stage by reason of their profession and where they were in terms of time and place. They were the first Irish born professionals to emerge on the international classical music scene. Six were men, and one was an attractive young female singer of the first rank. Their legacies live on today! Four of these artists were born in Dublin, two in Limerick and one in Waterford. This document is all about these remarkable individuals, their early backgrounds in Ireland, their lives, their music and fame. It details their initial activity when they first appeared professionally in Ireland, then London or Paris and afterwards in countries such as, Italy, Austria, Germany, Russia— in America, Canada, Australia, New Zealand, and in South America and other places. Their music was not “Irish” music in the “traditional folk music” sense. Their compositions and the music they performed was primarily based on the classical art music style and structure of Italy and France— and, to a lesser extent on the German/Austrian musical genre of the period. Over the years, great musicians and other personalities became associated in various ways with some of these Irish artists— these included such luminaries as— Beethoven, Weber, Rossini, Cherubini, Bellini, Donizetti, Mozart, Clementi, Liszt, Thalberg, Moscheles, Mendelssohn, J. Strauss, Berlioz, Chopin, Auber, Meyerbeer, Giovanni Ricordi, Francesco Lucca, Giuseppe Verdi, Queen Victoria, Lord Byron, Daniel O’Connell, Lionel Rothschild, US president, Millard Fillmore, Daniel Webster and others. Like so many other Irish born artists and writers of the nineteenth-century and beyond, they were initially drawn to London where the opportunities were more rewarding both financially and artistically. Some of these Irish artists traveled far and wide in the pursuit of their careers and financial rewards. Some never returned to Ireland once they left. Others came back to perform for short visits to great acclaim and success. All of these gifted Irish artists were active long before the recording industry as we know it today emerged in London, Paris, Berlin, Milan and New York from the 1890’s on. So their personal performances, or their voices never had the benefit of being recorded. However, their importance to musical history, apart from being Irish born was such that their contributions and reputations are still recognized internationally today. They are all of course the subject of various biographies and also encyclopedia and dictionary entries. Some of the works of the composers in the group, by reason of their art can be heard on modern day CD recordings. However, the legacy of our young Irish soprano is cast in time and place in the reviews of her performances. We will never really know how she sounded except for the thoughts expressed by reviewers in newspapers and musical periodicals of the time, in the cities where she performed around the globe. For almost 800 years Ireland had been under British rule, until 1921. Over the centuries Dublin had become a major port and economic center for British commerce and trade. It also had a strong military base in the city. It was considered by some to be the “second” city of the British Empire. Around the early 1700’s, musicians and singing-actors (many of whom were continental born) who had performed in London started to make the journey across the Irish sea to Dublin— a total distance of about 300 miles between the two capital cities, to perform at one of the many theatres then functioning in Dublin. Some such as, Tommaso Giordani, Johan Logier, Matthew Dubourg, Thomas Roseingrave, Francesco Scarlatti (brother of the great, Alessandro Scarlatti), Paul Alday, the singers, Antonio Sapio and Giuseppe de Benisand others took up residence and started to teach music and singing and perform at concerts. They were to have an important influence on the Irish musical scene in general. Many of these visiting international musicians and singers, introduced new songs, orchestral and vocal pieces, operas, cantatas and concertos. They also performed some of their own music and the works of other composers such as, Geminiani, Vivaldi, Paisiello, Cimarosa, Arne, Shield, Arnold, Storace— and the Germans, Stamitz, Haydn, Handel and later, Mozart. On occasions, they even extended their stay in Ireland to give concerts in places such as, Cork, Limerick, Kilkenny and Belfast. So classical music and opera started to make a significant foothold on Irish soil from around this time. Aristocracy with their Georgian homes and townhouses. The city was continually in an expansion mode during the middle and late eighteenth century. all were built during this period. By early in the nineteenth-century the city had a population of about 200,000 or so, residents. Its lifestyle was reflective in many ways of London. The most fashionable lodging place in the city, where most visiting musicians and singers stayed was Morrison’s Hotel at the corner of Nassau and Dawson Streets. The hotel opened in 1819 and remained in operation for eighty years until 1899, when it was demolished. Music flourished because of the city’s theatres and the associated lifestyle of its resident s. There were many Irish musicians who were actively engaged in composing what was primarily vocal music— which include songs, Glees and music for plays or ballad operas. Art music in Dublin towards the middle of the eighteenth-century and throughout the nineteenth-century was very much a mirror image of London’s taste. A number of London music publishing houses had also opened branches in Dublin to serve the needs of the affluent Anglo-Irish Ascendancy who controlled much of the musical activity in the country along with local Irish composers and performers. The Ascendancy frequently tied musical performances to charitable events, such as fundraising for hospitals, orphanages, prisons etc. There were about twenty such organizations specially chartered in Ireland for this express purpose by the close of the eighteenth-century. Towards the end of the year 1741, one of the most famous musician in Europe, George Frideric Handel (who had lived in London for many years) decided to visit Dublin. He also had received an invitation from the British Viceroy of Ireland, the Duke of Devonshire in Dublin to visit the “sister” isle. At the time, Handel apparently was somewhat discontented with recent London reviews and with the treatment of some of his works, as a result he decided to visit Ireland. which was in aid of both Mercer’s Hospital and several prisons in the city. Apparently around 700 people crowded into the Musick Hall for the event, which was highly successful. 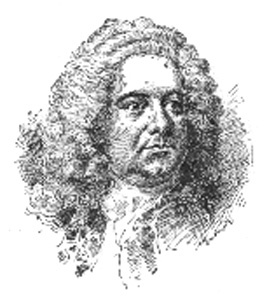 Handel gave performances of several of his other works at various venues in Dublin, including a revised version of his “Serenata or operetta” called, Hymen (Imeneo). However, only two performances of the Messiah were given, the premiere in April and another in June. He was very pleased with the standard of the musicians and the reception he received. He also visited Cork in early June 1742, where he had friends. While in Ireland he wrote a song called— Der arme Irische Junge (The Poor Irish Lad), based on an Irish music theme. A copy of the music is held by the British Library (ref. H992.m(7) in London. Handel returned to London in August 1742. He had indicated that he planned to re-visit Ireland, but unfortunately that never happened. 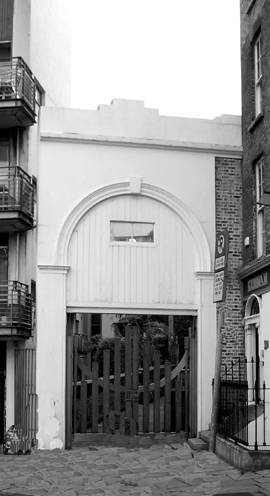 One small memento of Handel’s visit to Dublin remains— the arched white center entrance way (see image above left) to the Great Musick Hall is still extant and can be seen by visitors today, in its original location in Fishamble Street in Dublin. Handel’s visit to Ireland lasted almost ten months and it had the effect of really putting Dublin on the map for European musical artists of all types. It also set the tone for musical life in Ireland for the next 100 years or more. 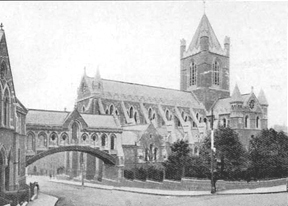 Both of these Anglican (Church of Ireland)Cathedrals in Dublin provided musical training, had large choirs and important musicians on staff for more than 150 years. Their members worked closely with local orchestras and with Handel when he was performing his various works in Ireland. Choirs from both Cathedrals participated. Their overall contribution to musical life in the Dublin area was unparalleled for decades. recesses with ornate stucco (see image opposite), and chandelier was reportedly able to accommodate almost 2,000 people (presumably standing) because it has no central support columns, which left the entire main floor space free for its patrons. would play an important part in the musical life of Dublin. At least five of our seven unique Irish musicians appeared there during the first half of the nineteenth-century. 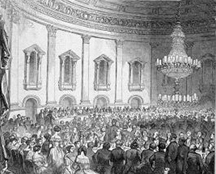 Many great musical giants also performed in the “Round Room” during these years at the Rotunda— people such as, Franz Liszt, Giuditta Pasta, Ignaz Moscheles, Nicolo Paganini, J.B. Cramer, Angelica Catalani, the very young Michael Rophino Lacy, Johann Logier, Nicholas Bochsa, Frederick Kalkbrenner, Paolo Spagnoletti, Fanny Persiani and Giovanni Battista Rubini. 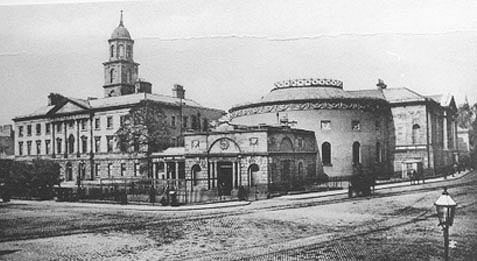 The Rotunda “Round Room” concert building (Ambassador) in Parnell Square, Dublin is still extant today. Sadly, despite the incredible history associated with the venue it is virtually derelict. However, it has been declared a historic conservation building. The Rotunda “Round” Room is a very historic place, musically. John Field, Michael Kelly, Michael W. Balfe, W. Vincent Wallace, Phillip Cogan, Catherine Hayes, and the eminent Irish cellist, Samuel Pigott with his unique 1721 Stradivarius cello (later known as the ‘Piatti’ cello; now owned by Mexican, Carlos Prieto). Pigott was also the founder of Pigott’s music shops in Dublin. As a result of the 1798 Irish rebellion, the Irish Parliament was immediately dissolved. Irish representation was effectively moved to London and with it the United Kingdom of Great Britain and Ireland was created. Many of the Anglo-Irish Aristocracy, who were members of the Irish Parliament left— with their money, their support for charitable organizations and for music and theatres. The city’s lifestyle would never be quite the same again. However, significant other social and political changes were also taking place around continental Europe following the French revolution and the end of the Napoleonic wars which would have a longer term impact on musical life in Ireland. Early in the new century, the Naples based young composer, Gioachino Rossini’s experienced great success in Italy, Paris, Vienna and London with his new operas and his unique musical style. It wasn’t long before traveling operatic troupes from London soon began arriving in Dublin to introduce the Italian composer’s popular works to an Irish audience. Vocal and instrumental concerts by visiting artists also continued to grow. However, eventually, in a few short years opera would become the dominant classical musical force in Ireland, and remain so through the end of the nineteenth-century and beyond. In 1811 Dublin saw it’s first Mozart opera, Cosi fan tutte. Excerpts from other Mozart operas were also performed around this time. Later in 1819 Mozart’s, Don Giovanni, and Le Nozze di Figaro were performed in Italian in Dublin. 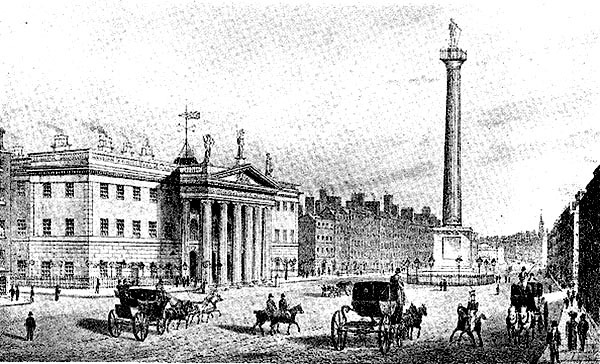 In 1821 the new 3,000 seat Theatre Royal opened in Hawkins Street, Dublin. King George IV on a visit to Ireland attended a Sheridan play at the theatre the year it opened.In 1827 an English language version of Weber’s opera Der Freischutz was performed there, with considerable success. Weber’s operas, Oberon and Abu Hassan followed the next year. French composer, Auber’s, opera, Massaniello was performed in 1829. Music performances which had depended so heavily on the Aristocracy for decades was now being replaced by commercial interests primarily managed out of London.The first formal season of Italian opera in Dublin at the Theatre Royal commenced in October 1829. It primarily consisted of five Rossini operas, Il barbiere di Siviglia, Il Turco in Italia, La gazza Ladra, Otello and Italiana in Algeri. All of these Rossini works were being produced just a few years after their premieres on the continent.The German/French composer, Giacomo Meyerbeer’s sensational opera, Robert the Devil was first heard in an English language version in Dublin in 1832, a year after its dramatic Paris premiere!In a short period of years the Theatre Royal would become the main venue for opera, concerts and other entertainment in Dublin, and it remained so— until it burned down in 1880. Some of our unique Irish musicians performed in the orchestra and on the stage of the Theatre Royal during those early years and also later on in the century. There were also theatres functioning in Wexford, Waterford, Cork, Limerick, Galway, Kilkenny, Belfast and other cities and towns in Ireland by the early decades of the nineteenth-century. There were also several theatre orchestras, and many music teachers in Dublin and elsewhere. Teaching and performing art music was flourishing at the time. In 1807 Angelica Catalani, one of Italy’s most renowned and highest paid sopranos first arrived in Dublin to give a series of concerts at the Rotunda. She also visited Cork. Catalani returned several times after that making her final visit in 1829.
during the Catalani concerts. Lacy who was born in Bilbao, Spain had an Irish wine merchant father and a Spanish mother. He became a skilled musician and a linguist who had been educated in Paris. He visited Ireland again at a later time. Another great Italian soprano, Giuditta Pasta visited Dublin towards the end of a guest of Lady Morgan (Sydney Owenson), at the author’s Kildare Street home. Pasta performed at the Rotunda while in Ireland. Within a few years, Pasta created the title roles in Vincenzo Bellini’s La Sonnambula and Norma in Milan. She would also become a close associate of another one of our unique Irish musicians. In 1826 the great pianist Ignaz Moscheles performed at the Rotunda. He composed a special piece “Recollections of Ireland” for his visit. From 1829 onwards Italian operatic troupes and other musicians regularly began traveling to Cork, Limerick and Belfast in addition to Dublin and other places. In 1838 the renowned pianist, Sigismond Thalberg gave a concert, in the company of one of our returning Irish artists. In 1826 the new Philharmonic Society was formed in Dublin— it continued to be active for the next fifty years. 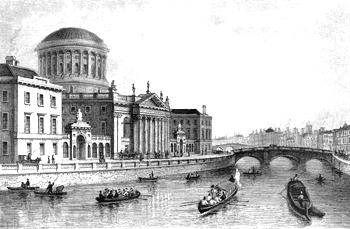 The Ancient Concert Society was organized by Joseph Robinson in Dublin in 1834. Women were permitted to participate as performers, which was something new! This was followed in 1848 by the Royal Irish Academy of Music which still functions today. The legendary Italian violinist, Niccolo Paganini performed in Dublin in 1831. He stayed at Morrison’s Hotel in Dawson Street. He was followed some years later by the great pianist and composer, Franz Liszt who gave concerts at the Rotunda. 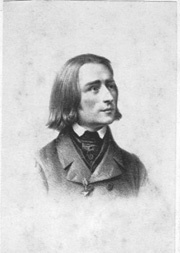 Liszt also performed in Kilkenny, Cork, Limerick and Belfast. In September 1836, perhaps the most prominent singer in Europe, Maria Malibran, was scheduled to visit Dublin for a concert. However, sadly fate took a hand and she died tragically in England from an accident, just before her planned visit to Ireland. Later, the famous soprano, Jenny Lind, made her Dublin debut with one of our unique Irish musicians directing her in operas and concerts to the delight of the audience. The great singer, Pauline Viardot Garcia, sister of Maria Malibran also performed in Dublin. Great international artists such as, Giuseppe de Benis, Antonio Sapio, Signora Kintherland and others came to Dublin from 1829 onwards. Later, some of the greatest singers in Europe, also appeared in opera including, Luigi Lablache, Giulia Grisi, Giovanni Mario, Fanny Persiani and Giovanni Battista Rubini. They performed in works by, Rossini, Bellini, Donizetti, and young Verdi at the Theatre Royal in Hawkins Street, Dublin. With all this activity traditional Irish folk music tended to fall out of style, at least in Dublin. Indeed, perhaps the last great “traditional music” event in Ireland of that period was the Belfast Harp Festival of July 1792, which fortunately had the musician and scholar, Edward Bunting present to manually record, for posterity the music of some of the greatest Harpers of the period, a number of whom were then quite old. It was in this overall environment that most of our seven unique Irish born musicians emerged for their early training and first professional experiences. Some of them were destined to become closely associated with a number of the above distinguished continental artists during the early to middle of the 19th century. These brief biographies are featured chronologically, based on the year of birth. Michael Kelly (1762-1826) – Singer, Composer and Theatre Manager. Michael Kelly (or O’Kelly)was born in Dublin in Dec 1762. He died in Margate, England Oct 1826. He was born into a musical family. His father Thomas Kelly was also a wine merchant and Maser of Ceremonies at Dublin Castle where he managed special functions. Kelly’s early musical training and vocal studies initially took place in Dublin, with a visiting Italian, Rauzzini and music lessons with Philip Cogan and possibly also taking some lessons with Michael Arne during a visit by the composer to Dublin. 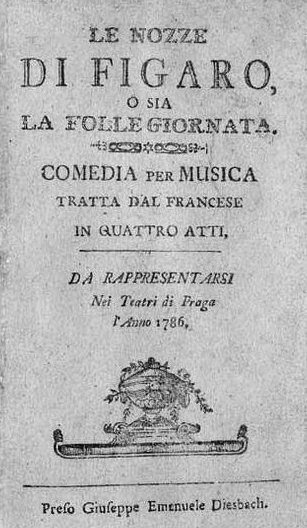 At the youthful age of 15 in May 1777, he performed a role in an Italian opera, La Buona Figliuola by Piccinni with a visiting opera troupe, either replacing a singer who became ill or possibly through a pre-arranged situation by his father who wanted to advance his son. In any event, he was advertised, not by name but as, “A young gentleman being his first appearance on any stage.” There is no known review of his performance. Later, on the advice of a visiting Italian singer Kelly decided to go to Naples for further vocal study. He departed Dublin in 1779. After a few years study and various operatic roles in Naples and elsewhere he made his way to Venice to perform in opera there. Venice was then under Austrian Hapsburg rule and controlled from Vienna. While performing in Venice he was invited by the Austrian Ambassador, Count Durazzo to sing at the Royal Court Theatre in Vienna, along with the British soprano, Nancy Storace, who was then accompanied by her brother, Stephen Storace the composer. Kelly had met the Storaces in Florence. By now Kelly had performed in many operas throughout the Italian states— he was a professional singer and he had also become fluent in the language. He made his debut in Vienna in April 1783 in Salieri’s opera, La scuola de’ gelosi along side Nancy Storace. During these years Kelly had gained great experience as a singer. However, perhaps his most significant contribution to classical music as an Irishman is the fact that during the four years he spent in Vienna he became a close friend and associate of the renowned composer, Wolfgang Amadeus Mozart. The relationship between the two musicians grew professionally and socially and it eventually led to the Irishman, Kelly being offered the roles of Don Basilo and Don Curzio in the world premiere of Mozart’s now famous opera, Le Nozze di Figaro in Vienna, in May 1786. Nancy Storace was also in the performance. An interesting related fact— is that Kelly’s name was shown as “Occhely” in the original Mozart manuscript (1786) for the opera! While in Vienna, Kelly was considered an important member of the Italian Opera there. He also met Gluck and studied the part of Pylades (Iphigenie in Tauris) with the composer. Michael Kelly and Nancy Storace historically were the only two British singers to have sung in the premiere of a Mozart opera. After Vienna, Kelly and the Storaces visited Mozart’s father, Leopold Mozart in Salzburg before continuing on to London in 1787, where he appeared in musical plays at the Drury Lane theatre. For almost twenty-years he had a successful career as a vocalist in England and Ireland. During this period he also gave concerts and had his first compositions staged. Subsequently, he took over management of the important King’s Theatre where most Italian Opera was performed in London. He also became the director of music at the Theatre Royal in Drury Lane in London. In Dublin he mounted seasons of Italian operas. In 1802 at the age of 40, he ventured into the wine business, opening a shop and music salon in Pall Mall, London. He was not successful and eventually his London business went into bankruptcy in September 1811, while he was in Dublin performing. His troubles continued to mount and rumors also began to circulate that some of the musical works Kelly has published over the years were possibly not his own compositions but music of other composers which he had brought with him from Italy. His last stage appearance was in Dublin in 1811, after which he decided to retire. He was almost 50 years old. In retirement he wrote a monumental (almost 170,000 words!) two-volume memoir with the assistance of a “ghost” writer friend, T. Hood. The memoir is still available today. It contains some fascinating information about Vienna and the time of Mozart in addition to Kelly’s own personal experiences. Kelly went on to compose a large number of songs in English, Italian and French which were published in London during the early 19th century. He also was said to have produced over sixty works for the stage. However, his output strategy seemed to be one of quantity rather than quality. One of his most durable compositions was, an opera called, Blue Beard (1798), which experienced considerable success. His association with Mozart brought him great fame and a place in musical history. Kelly’s life was fascinating enough for the 20th century writer Naomi Jacobs to publish a novel in 1950, The Irish Boy, based roughly on his life. There is also apparently, a possible film on his life in the works(2009) in Ireland. However, many of the songs he wrote were also successful in their day. His songs became popular not only in Britain and Ireland but also in America and elsewhere in the English speaking world. His tenor voice was said to have had good power and a wide range, although there is some evidence to support the fact that it may have been more in the “comprimario” class. He was also considered a good musician. He had a likable personality socially and he acquired many friends over the years. Unfortunately, none of his music has been recorded as far as it is known. Michael Kelly died in Margate, England in October 1826. He was an important musician and man of the theatre and quite famous in his day, particularly in London and Dublin. He was also an intimate friend of Richard B. Sheridan and the Irish poet and composer, Thomas Moore — and a noted bon-vivant! John Field was born in Dublin in Jul 1782. He died in Moscow, Russia in Jan 1837. He was the son of a violinist. Music had been an occupation in the Field family for several generations. Field first studied music with his father, Robert Field a violinist in an orchestra at one of the Dublin’s theatres. His son. John showing exceptional talent at age nine in 1791, was placed under the tutelage of the renowned Italian musician and composer, Tommaso Giordani who was then living and teaching in Dublin. Field made his official debut at age nine as a pianist at the Rotunda Concert Rooms in Dublin on March 24, 1792 in a series of three Lenten concerts that were arranged by Giordani under the title “Spiritual Concerts.” Field was advertised as, “Master Field a child of eight years old.” Field was of course ten years old at the time. He played, a pedal harp concerto by the Bohemian composer, Johann Krumpholtz on the piano. A newspaper report of Field’s performance said “…the concerto on the Piano Forte by Master Field was really an astonishing performance by such a child, and had execution far beyond what could have been expected.” Young Field performed at all three concerts, presumably with equal success. He continued to perform at other concerts in the Rotunda and in April of the same year he played an original work by his teacher Giordani which the teacher had composed for him. In 1795 Field did have some of his early Dublin compositions for piano published in London. In the summer of 1793, the young prodigy’s father moved the family to Bath in England where he took-up a position in the orchestra as a violinist. Their stay there was short for whatever reason, as a result the family moved on to London, possibly sometime early in 1794. Field’s father still recognizing his young son’s developing talents made the decision to place him with the well established Muzio Clementi, a pianist and composer who was then perhaps the most important teacher of piano in London. The decision was an expensive one as Clementi’s fees were very significant. Clementi also produced pianos and had a music salon in London where he sold pianos and sheet music in addition to giving lessons to selected pupils. As part of his apprenticeship requirements young Field was required to demonstrate the Field instruments to prospective clients. Through this exposure Field gained recognition and prominence as a soloist. He also gave concerts at which he played some of his own compositions. His first major composition, a concerto was composed in 1798 and performed early in 1799. He was now almost 17 years old and maturing as a professional artist. St. Petersburg in Russia and to other cities during which he promoted the sale of his pianos and music. He took Field with him as his assistant and for demonstrations. Over time Field built a strong international reputation as an excellent pianist and composer. In time, Field’s talents were always in demand from Russia to London from Paris to Vienna and lots of places in between because of his brilliance and style. By 1800 Field had technically completed his apprenticeship requirements with Clementi. 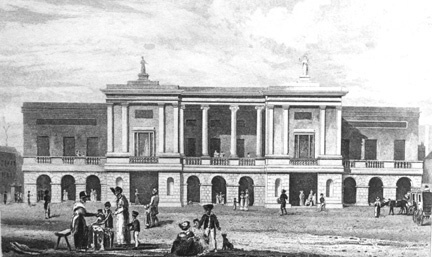 In 1803, Field decided to stay on in St. Petersburg which was the home of the Russian Royalty where there was much opportunity for sponsorship, teaching and concert activity. He had also learned French, which was the language of the Russian Royal Court and the Aristocracy. He traveled to places such as Riga, Mitau (now in Lativa) and Moscow and later returned to Paris, Vienna and London to give concerts with great acclaim. However, he did not visit Dublin. While in Russia, Field also had the distinction of giving piano lessons to the future great Russian composer, Michael Glinka, who is considered the father of Russian opera. In St. Petersburg in May 1810 he married a French student, possibly one of his more gifted pupils named, Adelaide Victoria Percheron. The marriage was not successful given Field’s eccentric itinerant lifestyle. While still married he had a romantic affair with a Mlle. Charpentier by whom he had a son named Leon in 1815. Field developed a strong affection for the boy. Leon later traveled with his father in Italy and other places. Leon also became a successful opera singer in his own right, under a different name. However, Field also had a son Adrien in 1819 by his legal wife, Adelaide . In time, his wayward double lifestyle and drinking supported by his large income from teaching, concerts and compositions— eventually resulted in separation from his wife Adelaide in Moscow in 1821. Field continued to travel extensively around Europe giving concerts to sold out houses, not only in Paris, Vienna and London but also in Brussels, Marseilles, Lyons, Geneva, Milan and Naples. He achieved great fame, particularly in London and Paris where the young Polish pianist Frederic Chopin attended his concerts, no doubt curious about Field’s new composition “the Nocturne” which Field had first composed and performed in Russia in 1814. His talents were particularly admired by composer, Robert Schumann and composer and pianist, Franz Liszt. His later years were plagued by excessive alcohol, a decline in his abilities to perform and later, by cancer. He did have a warm reunion with his mother in the 1820’s. She was now 78 years old and still living in London. He had provided for her financially over the years but somehow he had not taken the time to visit her in over 30 years. He died in Moscow at age 54 in January 1837. A gravestone marks his final resting place in the Vedensky Cemetery in Moscow. Having left Dublin with the family in 1793 he never returned to Ireland, not even to give one concert. Fortunately John Field music lives on today. His output was extensive. It included concertos for piano and orchestra, many nocturnes, Chamber music, rondos, fantasies, dances, songs and other works. His piano concertos and nocturnes have been widely recorded and are played frequently on radio and at live concerts. Throughout Europe during his lifetime he was accredited with being the composer who first developed the Nocturne format in music. His compositions for piano were to influence a whole new generation of pianists that came after him, people such as, Chopin, Mendelssohn, Liszt, Thalberg, Moscheles and others. Telarc CD 80370 – Piano Concertos, No. 2 & No. 3 – John O’Conor, Pianist and the Scottish Chamber Orchestra conducted by Sir Charles Mackerras. Thomas Moore (1779-1852) – Poet, Composer and Singer. Thomas Moore was born in Dublin in May 1779. He died in Wiltshire, England in February 1852. His father, John Moore was from Kerry— his mother, Anastatia was from Wexford. The father ran a modest grocery shop in Aungier Street in central Dublin. The building is still extant. While growing-up in Dublin he studied music and piano. He was also well educated in the classics in private schools in Dublin. He entered Trinity College, Dublin in 1794, graduating wit an Arts degree from the University in 1799. He then moved to London where he studied Law. However, his motivations from the beginning led him towards the literary and musical fields. His first literary work, Ode to Anacreon based on the Greek poet’s Anacreon writings, was published with great success in 1800. It was a work celebrating wine, women and song— as a result Moore developed a somewhat devilish reputation in London. The work was dedicated to the Prince of Wales. With the publications of the first of the ten volumes of Moore’s Melodies in 1808, Thomas Moore’s fame in the musical world was secured both in Britain and on the continent. Some considered the Melodies to be Moore’s greatest lifetime work. However, Moore’s talents were always more literary than musical, although by his own account it was really music that caused him to start writing poetry. Moore’s next endeavor, The poetical works of the late Thomas Little, published in 1801 continued in the same mode, although it was not quite as successful. His reputation grew to the extent that he was invited to the drawing rooms and salons of Society, where his vocal and musical attributes were also praised by the elite of London. In 1805, having spent some time on the Island of Bermuda as a British Government representative he took time off to travel in America and Canada. Meanwhile, his assistant in Bermuda proceeded to mismanage the Government funds and in the process Moore became implicated. To avoid imprisonment in Britain, Moore went to live in continental Europe instead of returning to Britain. During this period he spent extensive time traveling in Italy with his long-time friend, Lord Byron. During this period, Byron entrusted Moore with his written memoirs to “do with them as he wished.” Ultimately Moore, along with his publisher, John Murray, for whatever reason decided to burn Byron’s manuscript— preferring instead to write his own biography about his gifted friend based on Byron’s letters and Journal.Additionally, Moore also eventually managed to deal with his legal problems arising from his Bermuda financial obligations and was able to return to London and reside there. In 1808 the first edition of ten volumes of Moore’s Melodies was published, the arrangement was by the Irish musician John Stevenson. The poetry was by Moore, and the music for the songs was adapted from old Irish Folk tunes which had been collected and put on paper by Edward Bunting, who developed most of his collection while attending the Belfast Harp Festival of 1792. Eventually, the subsequent nine volumes which were published through 1834 contained more than 130 songs. Some of the more famous being— ‘Tis the Last Rose of Summer, The Harp that Once Through Tara’s Halls, The Minstrel Boy, Oft In The Stilly Night and Erin the Tear and the Smile. In 1817, Moore wrote Lalla Rookh, an extensive oriental romantic poetic work which became very popular and also the subject for an opera and other musical compositions by various European composers, such as Gaspare Spontini, Felicien David, Hector Berlioz and Anton Rubinstein and in Britain, Charles V. Stanford and Graville Bantock. 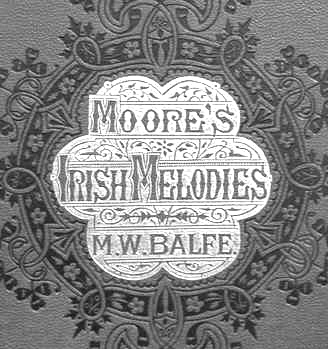 Throughout the years that have followed, many new editions of Moore’s Melodies have been published, including one particularly important arrangement by the Irish composer, Michael W. Balfe in 1859, in London and later, another by another Irish born composer, Charles V. Stanford. Many of the songs had strong patriotic themes which also made them very popular in America. Moore’s recognition continued to grow, not only in Britain but also throughout continental Europe and in America, Canada Australia and New Zealand. Selected songs from his Melodies were also translated into various foreign languages. The far flung fame and popularity of the Melodies resulted in him gaining a significant ongoing income from his work. His fame placed him in the front rank of of British Society. On the continent, renowned composers such as, Ludwig van Beethoven, Hector Berlioz and Robert Schumann produced selected arrangements of songs from the Melodies with translated text. And, perhaps Moore’s most famous song of all, ‘Tis the Last Rose of Summer became the main theme music for the opera Martha by Friedrich von Flotow which had its premiere in Vienna in 1847. In addition to his Melodies, Moore also composed several other songs, some to music by Irish composer, Michael Balfe. 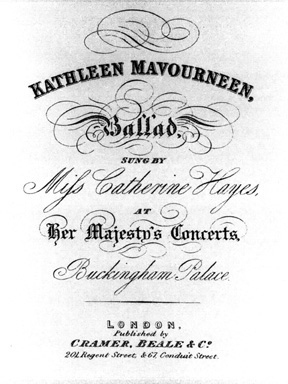 Moore’s songs and selected other works became quite popular with singers of the period, such as the great Irish soprano, Catherine Hayes who introduced several of them while visiting Australia in the 1850’s. To a lesser extent, Hayes’ renowned contemporaries and friends, Jenny Lind, and British tenor Sims Reeves also sang some of them. On the personal side, Moore was married to Elizabeth “Bessie” Dyke in 1811. Her father was from Cork and her mother was English. They had four daughters and two sons. Tragically all of their children died before the parents, which was not uncommon during the 19th century. Moore died in 1852 and his wife followed him in 1865. He’s buried at Bromham Cemetery, Wiltshire, England. Moore returned to Ireland many times throughout his life, particularly while his mother was alive. He was always welcomed with open arms by his friends and associated in the city of his birth, Dublin. Recorded in Dublin in 2008 for the “My Gentle Harp” program celebration of the 200th anniversary of the publications of the Irish Melodies. The Michael Balfe arrangements have been used for the majority of the songs. There are a total of 139 numbers including supplements and extra tracks with numerous vocalists and piano accompaniment by Una Hunt and Mairead Hurley. ESS.AY Recordings – 2 CD Set 1057/58. Includes 49 of the Melodies/Songs. Romancing Rebellion, 1798 and the Songs of Thomas Moore– Kathleen Tynan, Soprano, Dearbhla Collins, Piano – Includes song arrangements by Beethoven, Berlioz, Stanford and others. George Alexander Osborne (1806-1893), Pianist, Composer, Teacher and Accompanist. George Alexander Osborne was born in Limerick in September 1806. He died in London in November 1893. He came from a musical family. He studied music initially with his father, George W. Osborne who was the organist at the Limerick Cathedral and a teacher of piano. The younger Osborne was also an organist at St. John’s Cathedral until his departure from Limerick in 1825. During a visit to an Aunt in Brussels in 1825 he was introduced to the Prince de Chimay who was influential in helping him become the musical instructure to the Prince of Orange. Brussels and the area known as Belgium today at that time was under Dutch rule at the time. He also met the violinist Charles A. de Beriot during his stay in the city. Sometime later, possibly around 1826 and most probably at de Beriot’s suggestion he went to Paris to study music and the piano with Johann Pixes, François Fetis and Friedrich Kalkbrenner. The latter was one of the foremost teachers in Paris at the time. While in Paris he became associated socially and professionally with such immortal musical personalities as, Hector Berlioz, Franz Liszt, Daniel Auber, Luigi Cherubini, Felix Mendelssohn and Gioachino Rossini. It was during this period that he also met the Irish musician and singer, Michael W. Balfe who was a protege of Rossini and studying to become a singer in Paris. The two Irishmen became lifelong friends. He later became a close friend of the pianist, Frederic Chopin. During these years in Paris Osborne, gave concerts and played at public performances with Chopin and others, always receiving excellent reviews in the musical press. At Chopin’s Paris debut in February 1832 Osborne participated along with others including Chopin in a polonaise for six pianos by Kalkbrenner. In 1830 he had his first musical compositions published. These included selected waltzes and fantasies based on excerpts from Rossini operas. He would later do the same with some of Balfe’s operas. He also became a teacher. His most important pupil during this period was the future orchestra leader and conductor, Charles Halle. His relationship with the composer, Hector Berlioz was particularly close and possibly he first introduced the Irish actress, Harriett Smithson to Berlioz when she was in Paris performing Shakespeare works at which Osborne assisted musically. Berlioz and Smithson afterwards married. Musically, Osborne and de Beriot were to collaborate on many duets for piano and violin over the years, not only composing pieces together but also performing together. One of their most famous pieces was a duet arrangement from Rossini’s monumental 1829 opera, Guillaume Tell. He also met the most famous singer in Europe at the time, the mezzo-soprano, Maria Malibran whom he accompanied on occasions and who eventually married Charles de Beriot. In 1840 Osborne married Lucy South Adams in Paris at the British Embassy. Her family was from Devon in England. They had three children— a son and two daughters. As far as it is known they were never active in the musical profession. Osborne’s wife died in London in 1858. He married again in 1860 this time to Grace Octavia (Chappell) a member of the London based, Chappell music family. His second wife died in 1877. There was one child from the second marriage, Clarence Arthur Osborne who was born in 1863 and who died in 1937. Early in 1842, Osborne and his wife Lucy welcomed into their home the young Irish soprano, Catherine Hayes and her mother Mary Hayes, who were also from Limerick. Catherine Hayes came to Paris on the recommendation of the great basso, Luigi Lablache to study with the eminent vocal teacher Manuel P. Garcia, the brother of Maria Malibran. Her sister Pauline Viardot Garcia was also one of the great singers on the time.For the next two year Catherine Hayes stayed with the Osbornes. The young soprano was destined for great fame in Italy, Britain, America and Australia. Through much of her short life and brilliant career George Alexander Osborne was her friend, he accompanied her on tours, was present at her wedding and was there at her early demise a few years later. 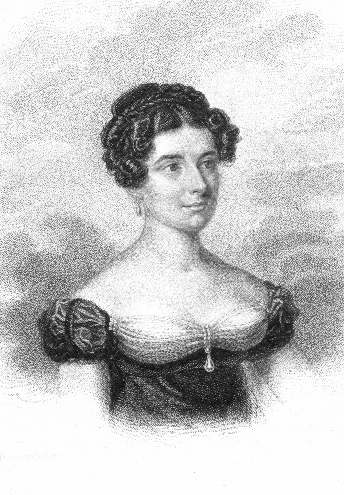 Osborne’s younger sister, Elizabeth “Bessie” was also in Paris studying singing with the famous tenor and teacher Giulio Bordogni around this time. Bessie later made her debut in London in the principal role in Bellini’s La Sonnambula with considerable success. After her marriage she gave up her singing career. In 1844 with political unrest in Paris the Osbornes moved to London. In London Osborne continued his compositions. In 1847 he published perhaps his most famous work for piano, La pluie de perles (Shower of Pearls). Its fame and great popularity as a salon piece earned Osborne a significant income, both in Paris and London and no doubt elsewhere. by the 1850s Osborne was much in demand for concerts in London and other places in the British Isles. Around this time he also composed two operas, Sylvia and The Forest Maiden. However, it appears that neither was ever produced. Osborne lived a long life. During his latter years he was a director of the Philharmonic Society in London, a position he later resigned. He also became a director at the Royal Academy of Music. He stayed active musically almost up until his passing. He also made occasional visits to Dublin where he still had several friends from his early days. On one of these occasions he was elected as a member of the Royal Irish Academy of Music. Osborne died at his home in London in November 1893. He is buried at Highgate Cemetery in London. In Victorian Britain, Michael Balfe was to music what his renowned contemporary Charles Dickens was to literature. The popularity of their respective works reached far beyond London, Dublin and New York, in the English speaking world. Balfe also achieved great fame in Paris, Vienna, Berlin, Leipzig, Trieste, Bologna and St. Petersburg in Russia. Michael W. Balfe was born in Dublin in May 1808. He died at his home in Ware, Hants (outside London) in October 1870. His father, Michael William Balfe was a dancing master and violinist who offered classes in Dublin and Wexford at various times of the year. 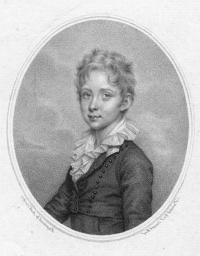 Young Balfe made his first public appearance as a violin soloist at age nine at Dublin’s Rotunda Concert “Round” Room in May 1817. He was advertised as “Master Balfe, a child of seven years old, pupil of Mr. O’Rourke [will perform] a concerto on the violin.” Balfe of course was actually nine years old at the time. He later participated in other concerts at various venues in Dublin. He had his first musical composition, a song, The Lover’s Mistake published in Dublin in December 1822. The words were written by the poet, Thomas H. Bayly. Balfe initially studied music and the violin with his father and later with a prominent orchestra member, James Barton at one of Dublin theatres and with the musician, William O’Rorke (later names Rooke) and in Wexford. On the death of his father in January 1823 Balfe went to London where he joined the orchestra at the Theatre Royal, Drury Lane. In March of that year he performed a violin solo with the theatre orchestra which was conducted by the important musician, Sir George Smart. His review was generally good, focusing more on his youth and potential rather that his actual performance. During this period his voice had matured as a baritone and ever resourceful Balfe decided to take on the operatic role of Capser in a English version of Weber’s Der Freischutz, in Norwich. It turned out to be a disaster for him because of stage fright. The experience didn’t have any lasting effects on the young musician and singer, since he decided to initially, take up a singing career in Italy. In 1825 he decided to pursue his career in Italy. He first went to Paris for a short stay. He had the opportunity to meet the eminent musician, Luigi Cherubini who was very impressed with the young Irishamn’s talents, offering him the possibility of study, which Balfe decided against at that time. Sometime later Balfe continued on to Italy. He spent the next two years there, studying music and singing, mostly in Milan. His hopes for some success there were dashed when his important contact, Joseph Glossop the London born administrator of various Royal Theatres in Milan including La Scala gave up the theatres. Somewhat frustrated, and most probly short on money Balfe left Milan. He returned to Paris where he contacted Cherubini who was the Director of the Conservatoire. The Italian composer introduced him to, Gioachino Rossini who was then a resident of Paris. On Rossini’s advise Balfe took more vocal lessons with the tenor and teacher Giulio Bordogni who was also a resident of Paris. In time, Rossini became Balfe’s mentor, enabling him to make his debut at the Italian Opera in Paris as Figaro in Rossini’s opera, Il Barbiere di Siviglia early in 1828. During this time, Balfe shared the stage in leading roles with such immortal as, Henriette Sontag, Maria Malibran and his teacher, Bordogni. His cosmopolitan style, language skills, (he had quickly learned to speak French and Italian) and professional music skills helped him build strong friendships throughout his lifetime. Balfe later returned to Italy with a letter of introduction from Rossini. He s pent the next seven years there singing leading baritone roles in operas by Rossini, Bellini, Donizetti and others (Verdi was not yet on the scene). He sang with the future great soprano Giulia Grisi at Bologna in 1829. She would become a lifelong friend. While in Bologna he was inducted into the Societa Filarmonica as a lifetime member in the “composer” category. He also composed his one and only Sinfonia in Bologna, the manuscript score (88 pages) is still extant. A copy is held by the author. Balfe partnered with Maria Malibran in Rossini’s Otello (role of Iago) at La Scala Milan and in Bellini’s La Sonnambula (role of Rodolfo) in Venice. in the 1830s. During these years he also composed and had performed three opera— one each for Palermo, Pavia and Milan. In Milan he first met and later married Lina Roser, in Lugano, Switzerland. 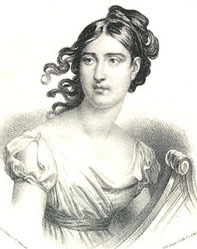 Roser was a young soprano of Austrian parentage who was a fine singer She had studied with one of Mozart’s sons (Karl Mozart) in Milan in the later 1820’s. Her father, Franz de Paula Roser was a composer (60 works for the stage) and theatre manager in Vienna and elsewhere. He was living in Pest (Budapest) when Lina (Madelina) was born in 1810. As a boy, he had studied for a short period with Mozart. His father Johann Roser and Mozart were friend. Balfe and his wife and their young daughter, Louisa arrived back in London in May 1835 as part of a visiting Italian troupe of singers from Milan. His initial success as a composer in London took place some months later with the premiere of his opera, The Siege of Rochelle in October 1835 at the Theatre Royal, Drury Lane. The opera ran for over 70 nights with great success. The work was an overnight sensation with its Italian style and memorable melodies. It launched Balfe’s career. 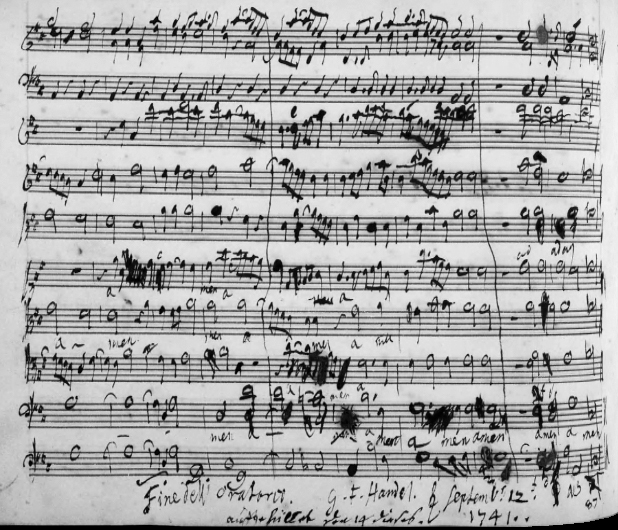 Balfe quickly followed with a new opera, The Maid of Artois, this one was composed for his friend Maria Malibran who was visiting London at the time. It was a sensational success both artistically and financially. He continued to compose operas for London. His next big event was the opera Falstaff which was based on the Shakespeare play, The Merry Wives of Windsor. He composed it to an Italian libretto for the Italian Opera at Her Majesty’s Theatre in London. It premiered in 1838 with four of the greatest singers of the time, Giulia Grisi, Luigi Lablache, Giovanni-Battista Rubini and Antonio Tamburini. The four were known as the “Puritani quartette” since they had premiered Bellini’s opera I Puritani in Paris in three years earlier. 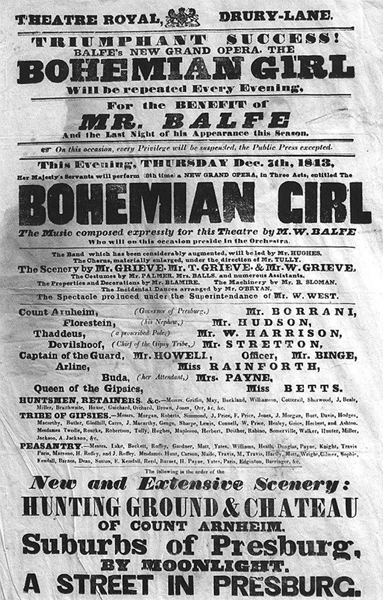 However, Balfe’s real fame occurred in November 1843 at the Theatre Royal, Drury Lane when his opera, The Bohemian Girl premiered. It became a sensational hit, receiving over 100 performances during its first season. The Opera was seen in Dublin, New York and Philadelphia within a year in 1844. It was then translated into German having its premiere in Vienna in 1846, with Balfe conducting. It was later translated into Italian and performed in several Italian cities, such as, Trieste, Bologna, Verona etc. The Italian version, La Zingara was also performed in London, Dublin, New York, Boston and San Francisco. 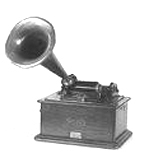 French versions La Bohemienne, were produced in Rouen in 1862 and in Paris in an augmented score in 1869. For the next 100 years the opera swept around the world to Australia, New Zealand, Canada, America, Mexico, South Africa and continental Europe. It was also performed in many different languages. It became one of the most successful opera of the 19th century. For seven year, Balfe was the music director at Her Majesty’s Theatre which was the home of Italian Opera in London. He directed the London premiers of various operas, including Verdi’s, Nabucco, Attila and I due Foscari. When Giuseppe Verdi first came to London to premiere a new opera, I Masnadieri in 1847 Balfe worked with him at rehearsals and later took over the conducting of some of the performances. 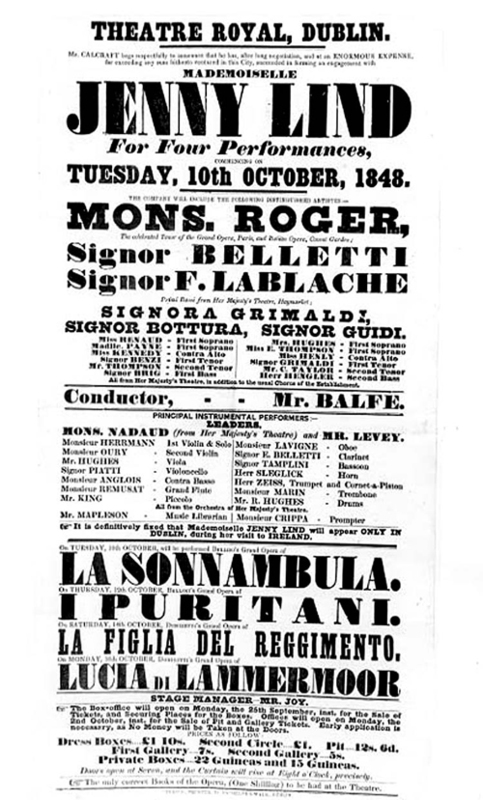 The period 1846-1852, saw Balfe as music director at the Italian Opera in London conducted more than 300 operatic performances of 43 works by various composers including one of his own, I quattro fratelli. He also returned to Dublin to many time to perform in operas and conduct operas, including the debut of the famous soprano, Jenny Lind. During the 1850s, Balfe visited Berlin where he conducted one of his operas, Der Mulatte. The work was well received and he personally received much publicity. He also made at least two visits to Russia where he gave concerts in St. Petersburg and Moscow. He did not conduct any of his operas while in Russia, even though his music was well known. He did perform in concerts in both cities. After Russia he returned to Vienna where he conducted his opera Keolanthe, with a German libretto— the opera had a long run. When he finished his time in Vienna he went on to Trieste to perform and direct the Italian premiere if his opera La Zingara. His final years were spent in Paris, completing an augmented French version of his opera The Bohemian Girl, which had its successful premiere as, La Bohemienne in 1869. Afterwards, Balfe returned to England to complete his last opera, Il Talismano, which has it premiere four years after his death. Balfe composed twenty-one (21) operas for London, three (3) for Paris and one each (4) for Palermo, Pavia, Milan and Trieste. He also revised and augmented a number of his operas which had their premieres in German language versions in Vienna, Berlin, Leipzig, Frankfurt, Hamburg, Munich, Brunswick, Prague and Pest (Budapest). In all, over his lifetime, Balfe composed twenty-eight (28) operas. When his foreign language revised and augmented versions are added he actually composed forty-three (43) works for the stage. He was the only British musician in the 19th century to compose a stage work, L’etoil de Seville, for the Paris Opera— which he did quite successfully in 1845. It had fifteen performances with a stellar cast. Chopin, Auber, Meyerbeer and others attended the premiere. He also composed about 250 songs (to words by Longfellow, Wordsworth, Moore, Thackeray, and other poets) which were published during his lifetime, along with at least eight cantatas, a number of instrumental pieces, for piano, cello, horn and violin and at least one Sinfonia in 1829. Balfe died at his home (which is still extant) in the town of Ware, Herts., (outside London) in October 1870 after a protracted bronchial illness. He is buried in Kensal Green Cemetery, London. RTE Orchestra (Dublin) conducted by Marco Zambelli with an international cast of singers. Orchestra conducted by Richard Bonynge with an international cast of singers. The Power of Love – British Opera Arias (18 total tracks with 9 tracks of Balfe arias and 9 by other composers including Wallace and Sullivan). Australian Opera Orchestra conducted by Richard Bonynge with Deborah Riedel, soprano. The Sleeping Queen – operetta by Balfe. Soloists of The Opera Theatre Company (Dublin) with piano accompaniment by Una Hunt – Total time 47 minutes. Romantics in England – Music for Cello & Piano – includes the Balfe Cello Sonata along with works by Quilter, Bainton, W. Macfarren and Coldridge-Taylor. William Vincent Wallace (1812-1865), Composer, Pianist, Violinist & Teacher. W. Vincent Wallace was born in Waterford, Ireland in March 1812. He died in the Pyrenees, France in September 1865. His father, William Wallace was from Ballina, Co. Mayo and his mother was from Portdarlington in Co. Laois. The father was a bandmaster attached to one of the local British regiments. The father was said to have been an excellent musician. Young Wallace received his first music lessons from his father. He learned to play the violin and piano, becoming quite accomplished at both instruments. The family moved to Dublin in 1825, where Wallace became a member of a Theatre Royal Orchestra in Hawkins Street as a violinist. He also continued with his music— studying the piano with William Conran who was an outstanding pianist and with Haydn Corri for the organ. Eventually in 1830 he was offered the job of organist at the Cathedral in Thurles, County Tipperary along with Professor of Music at a local Convent. Wallace returned to Dublin some time later where he married Isabella Kelly, one of his pupils from the Convent in Thurles. He rejoined the Theatre Royal orchestra in Dublin where he sometimes took over the leadership of the orchestra. The Theatre Royal, Dublin at the time was being managed by the London impresario Alfred Bunn who by coincidence would have an important influence on Wallace’s future musical career some years later on. Wallace was working in the orchestra at the Theatre Royal when Nicola Paganini, the great Italian violinist visited Dublin in 1831. Wallace was apparently astonished at the playing technique of the gifted Italian violinist. He apparently afterwards endeavored to duplicate Paganini’s technique in an effort to improve his own skills. It was some months after Paganini’s visit that Wallace first performed his own composition for violin, a concerto which was no doubt influence by the renowned Italian’s skills. For the next 35 years Wallace’s career and life took on some bizarre twists and turns around the Globe. It is difficult to sorts fact from fiction when it comes to some of his reported personal experiences. He first decided to live in Australia apparently looking for a better climate since he suffered from asthma. He departed Liverpool, England with his wife, Isabella in 1835 arriving in Hobart, Tasmania in October of the same year. It seems that Isabella’s sister, Alice accompanied them and possibly some other family members including Vincent and Isabella’s young son, said to be two years old at the time. There is also some evidence that Wallace and his sister-in-law, Alice may have had an affair during the voyage. However, generally the sparse amount of evidence relating to who was in the Wallace party on arrival in Hobart is conflicting, confusing and frequently unsupported. The fact remains however, that he was in Tasmania during this period. During his stay in Australia, Wallace organized concerts in Hobart. He traveled on to Sydney early in 1836 to find that the Governor of New South Wales was an Irishman from Limerick, Sir Richard Bourke who became interested in the Irish composer’s work. It wasn’t long before Wallace was giving highly publicized concerts with Bourke as his principal sponsor. This activity continued for a few years, giving Wallace high viability in the community and no doubt some teaching opportunities and a good income. After a failed attempt to establish a permanent Academy of Music, in Sydney, Wallace found himself heavily in debt and with no way to repay it. Additionally, his former patron, Sir Richard Bourke was no longer in office. In 1838, now 26 years old Wallace departed Sydney, with little fanfare, setting sail for Valparaiso in Chile (his wife and son had apparently earlier left Sydney for Ireland because of illness in her family) which at that time had important Italian Opera season annually and presumably other musical activity. On the way there he stopped off in New Zealand during which by his own account, related many years later to the French composer, Hector Berlioz, that he was almost eaten alive by cannibals! If we are to believe Wallace’s story he eventually went on to Chile where he gave concerts as he did during most of his travels. He later traveled to Lima, Peru and then to Buenas Aires and on to Jamaica, Cuba amd Mexico. Cuba and Mexico held extensive Italian opera seasons during the nineteenth-century. Possibly he participated in the orchestra or as a conductor. In any event by 1841 he was in Mexico City and here he performed as a conductor at the opera. While in Mexico he also composed and performed a Mass. He ultimately continued on to New Orleans, Philadelphia, Boston and New York where he, reportedly became involved as a founding member of the New York Philharmonic Orchestra. While in New York, Wallace also remarried, this time to the pianist, Helene Stoepel. Along the way he had amassed a large fortune as a result of his activities. Throughout this period of his life he worked hard at performances and also probably did some teaching. He eventually returned to London with his wife, in 1845 where he gave a concert at the Hanover Square Concert Rooms in May of that year. Around this time, Wallace was introduced to the poet Edward Fitzball who had written operatic librettos for other London based composers including, Michael Balfe. Fitzball liked Wallace’s proposal for an opera and they set to work on what would become the composer’s most successful work, Maritana which had its premiere at The Theatre Royal, Drury Lane in November 1845. It gave Bunn an important new English opera to produce at a time when Balfe was busy on the continent composing a new work for the prestigious Paris Opera. Most of the critics loved the new Wallace opera comparing his outstanding musical talents to those of his successful countryman, Michael Balfe. Wallace next appeared in Dublin with a concert version of Maritana at the Rotunda Concert Rooms with equal success. Sometime later the composer brought the Drury Lane company to Dublin to give a full performance of Maritana, which proved to be virtually as popular as Balfe’s Bohemian Girl in terms of appeal in the English speaking world throughout the 19th century. Wallace also created and performed a German version of it for Vienna in 1848. It was also given in Hamburg in 1849 and Prague in 1851. Meanwhile, the English language version of this popular opera was performed in places such as, New York in 1848, Sydney in 1849 New Orleans in 1876 and Cape Town in 1887, to name a few of the venues. 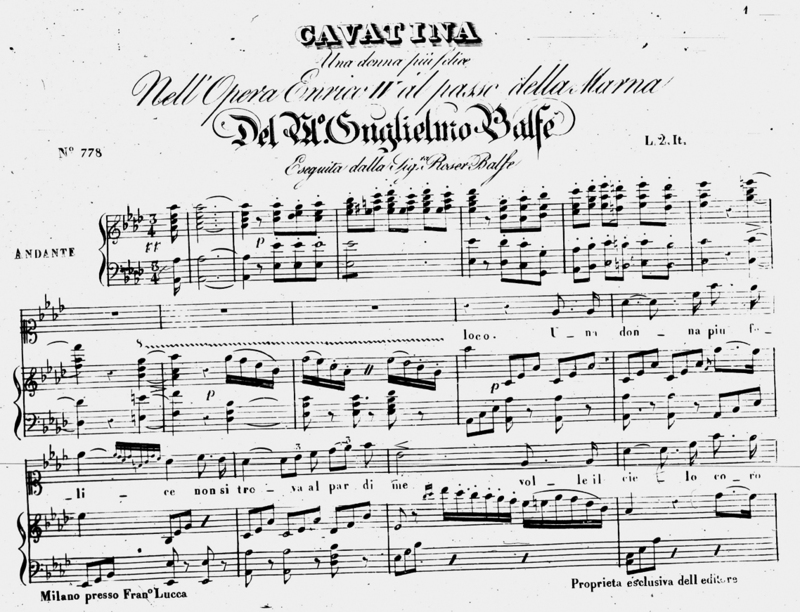 The score was also translated into Italian, though it does not appear that it was ever performed in Italy. However, the Italian version was given in Dublin in 1877, London 1880 and New York 1885. Wallace composed five more operas which saw performances. None however achieved the fame and success of Maritana. In 1847 he premiered Matilda of Hungary at Drury Lane with a libretto by Alfred Bunn. The critics considered the libretto to be one of the worst ever written. In 1849 Wallace started traveling again. What prompted this is not fully known. He first spent time in Brazil and later went to New York. While in New York he met and married a pianist, Helene Stoepel, apparently considering his earlier marriage null and void, because he was under age when it occurred and made to convert to Catholicism! There were two children from the second marriage. He also took out American citizenship during his stay in New York. The Amber Witch his fourth opera was first produced in London in 1861, to a libretto by the critic, H. F. Chorley. It achieved a certain amount of success. However, the opera did not appear to have any staying power as it had only one or two revival. Although Wallace apparently considered this to be his best work. This was followed by Love’s Triumph in 1862 and The Desert Flower in 1863. The latter did have some performances in New York in 1868. Both of these works appeared to have had bad librettos which did not help. Wallace also wrote numerous pieces for piano which were published, and which became very successful. These included, nocturnes, waltzes, polkas— and fantasies on popular Irish and Scottish airs by Moore, Burns, etc. He also wrote a significant number of songs, probably around 100 or more. One of these, Why do I weep for thee? he composed in 1849 for the celebrated young Irish soprano Catherine Hayes who was then one of the leading singers at the Royal Italian Opera in London at the time. He also composed a remarkable series of ” Souvenier de L’opera – Fantasies de Salon” for piano based upon twelve different themes from the operas of Mozart, Bellini, Donizetti, Weber, Auber, von Flotow, Rossini, Verdi and his own opera Maritana. These were published in New York in the early 1850’s. Wallace was an outstanding pianist and violinist. He spent most of his final years in Germany and France, possibly because of his second marriage which would not have been acceptable in Victorian Britain, in view of the fact that he had never been legally divorced from his first wife who was a Catholic. In his later years Wallace suffered from eye problems to the degree that he almost went blind. It may have prevented him from possibly working on a new opera for Paris. In the late 1850s he also suffer a heart attack from which he never really recovered. He eventually went to live in France. He died in the Pyrenees in France in September 1865, leaving his wife, Helene and two sons. He is buried in Kensal Green Cemetery in London, not far from his fellow countryman and contemporary and friend, Michael Balfe. In anticipation of his bicentenary a new headstone has recently been placed over his gravesite by his friends from Ireland. NEW – Lurline – Complete opera – English libretto – 2 CD set with a cast of international singers and the orchestra conducted by Richard Bonynge. The Meeting of the Waters – Celtic Fantasies for piano – selection of Wallace Irish (and Scottish) fantasies for piano including The Minstrel Boy, The Meeting of the Waters and The Last Rose of Summer – CD (1) -17 tracks. To My Star – Celtic Romances for piano – selection of 15 romantic Wallace piano pieces including, a Waltz, Etude, Nocturne, Polka and Mazurka and perhaps one of his most famous compositions, La Cracovienne, composed in New Orleans in 1842. CD (1) – 15 tracks. Catherine Hayes was born in Limerick in October 1818. She died at Lewisham (London suburb) in August 1861. Her father, Arthur W. Hayes was a bandmaster in the local militia. Her mother was Mary (Carroll) Hayes. The mother was a servant working in the household of the Earl of Limerick. There were two children, Henrietta who was born in 1816 and Catherine, in 1818. The father abandoned the family, for whatever reason around 1823, never to be heard of again. Catherine was born with an innate musical talent and a beautiful soprano voice. Through a series of events she was “discovered” by the Anglican Bishop of Limerick, the Reverend Edmund Knox while singing in the Earl of Limerick’s garden. The Bishop’s palace was next door to the Earl’s home. With the Bishop’s help, Catherine took vocal and musical lessons— initially in Limerick, then in Dublin with the vocal teacher and coach Antonio Sapio. With Sapio’s help a series of concerts were arranged at the Rotunda Concert Rooms in Dublin. After these events her career developed significant momentum. One of these concerts in January 1841 features the renowned pianist Franz Liszt, then 30 years old and on his first visit to Ireland and the British Isles. Catherine shared the same stage as Liszt, singing two arias. The conductor for the occasion was the young Louis Lavenu, a London born composer and ‘cellist, who was the son of one of the partners in the music publishing firm of, Mori & Lavenu of New Bond Street, London. Catherine and Lavenu’s future would be intrinsically entwined professionally, around the world. One of the pieces played by Liszt that eventful night was from Donizetti’s recent great operatic success, Lucia di Lammermoor. At a future time Catherine Hayes was destined to be one of the best interpreters of the opera’s title role, in Milan, Vienna, Rome, and London! Later in the year she attended her first opera, Bellini’s Norma, with the remarkable soprano Giulia Grisi in the title role and the great bass Luigi Lablache in the role of Orveso. Lablache was to have a major influence on her future career. The young vocal student decided she wanted to follow in Grisi’s footsteps. Sapio arranged an audition for her with his friend Luigi Lablache, whose mother was of Irish extraction. Lablache recommended that she go to Paris to study with Manuel P. Garcia the eminent vocal teacher of the time. Having gained her sponsor’s approval the young soprano and her mother arrived in Paris in October 1842. They took lodgings with the Limerick born pianist and teacher, George A. Osborne (see above) and his wife Lucy. Osborne sometime later featured her as a soloist in one of his local concerts in Paris. Shortly after arrival Catherine commenced study with the famous singing teacher, Manuel Garcia, brother of the renowned singers, Maria Malibran Garcia and Pauline Viardot Garcia. After almost two-years of study and at Garcia’s direction early in 1844, Catherine and her mother departed for Milan to meet with Felice Ronconi a member of a distinguished family of musicians for operatic coaching. The young Irish soprano and her mother arrived in Milan at a time when the Giuseppe Verdi was emerging as the next great Italian operatic composer. Verdi’s first great operatic success, Nabucco had its premiere at La Scala just two earlier. Verdi’s only pupil and future assistant Emanuele Muzio also arrived in Milan around the same time as Catherine and her mother. Destiny was to link Catherine Hayes and Muzio artistically, in an important operatic enterprise, a few years later. After concerts in the home of Giovanni Ricordi (founder of the Ricordi music publishing empire), the young soprano’s career took off dramatically. She made her debut at the Italian Opera in Marseilles, with first night nerves and ultimately great success. Bartolomeo Merelli, famed director of La Scala, Milan offered her a contract for his new season. Her fame spreads quickly— she’s in demand in Venice at the great La Fenice opera house. The well established composer, Federico Ricci and others compose operas for her to premiere at La Scala, and La Fenice. She next traveled to Vienna— to sing her most renowned role, Lucia di Lammermoor. Her performances there is attended by the Habsburg Royal Family in full costume and with a large entourage at the Karntnertortheter (Royal Court Theatre). The famous soprano Jenny Lind, is also singing there at another theatre. The two singers’ paths would cross many times in the years ahead and particularly in England and America, where they became good personal friends. Back in Milan, Catherine continued to be the star at La Scala. During this period she is paired at La Scala with a new tenor— in her most famous role, Lucia di Lammermoor. The tenor is an elegant Englishman, Sims Reeves with an exciting voice, good musical talent and a handsome presence. Their performances together at La Scala capture the headlines with rave reviews. They are the same age. It is the beginning of what would become an intimate relationship later in London and Dublin. Giuseppe Verdi shows an interest in her for one of his new operas, I Masnadieri. 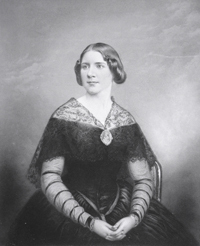 However, Jenny Lind is selected and she creates the opera in London in July 1847. One month later, Catherine was coached for the opera by Verdi’s assistant, Emanuele Muzio. She creates the Italian premiere at Verona in December 1847. By now her fame has also reached London where her La Scala performances are reported on regularly in the musical press. Early in 1848, revolutions break out in Milan and other places in Europe. La Scala shut down for the rest of the year. Catherine and her mother leave the city for Florence where she’s engaged to sing by another important impresario, Alessandro Lanari. Sometime later in Genoa she was approached by a representative from the Royal Italian Opera, Covent Garden, London, who offered her a contract for the season. Early in 1849 Catherine, her mother and sister arrived in London. It is their first visit ever to London. Her Limerick friend George Osborne and his wife are now living there also, b ecause of the political unrest in Paris. She make her operatic debut at the Royal Italian Opera at Covent Garden with much success. Later in the year she performed at Buckingham Palace for Queen Victoria, Prince Albert and 500 guests, along with a small group of leading Italian singers. She is greatly applauded and after a evening of Italian operatic arias and duets she is asked for an encore by the Queen— the young Irish soprano obliges with a song— Kathleen Mavourneen. The next day the Queen recorded in her diary how pleased she was with the young singer’s performance! Catherine returned to Dublin in November 1849 to perform in Lucia di Lammermoor and other roles. She was greatly praised by the critics. During this time in Ireland she also performance in opera in her home town of Limerick and in Cork— to sold out houses. For the next two years Catherine performed in opera and in concerts throughout Britain and in Ireland. In 1851 she was invited to Rome to sing in Donizetti and Bellini operas there. Her performances caused such a furor that in recognition she was awarded a Diploma from the Academy of Santa Cecilia, in Rome— a very special honor. Catherine afterwards returned to London to take up her concert schedule. In September 1852 she departed for New York. Her mother and sister and a small party of singers accompanied her along with her friend, Louis Lavenu as music director. For the next two years Catherine travels up and down the east coast of America giving concerts from New York to Montreal, from Boston to New Orleans. She travels on the Mississippi River Boats performing in the river town along the way from Baton Rouge up to Cincinnati and on to St. Louis, Chicago, Detroit, Cleveland and Pittsburgh and back to upstate New York for more concerts in Buffalo and Toronto. On her return to New York city she met a young American, William Avery Bushnell who worked for the great American showman, P. T. Barnum and who has assisted with the management of Jenny Lind’s tour of America the previous year. Bushnell takes on the role of manager of the Hayes group, setting up a tour of California under the management of P. T. Barnum. The group arrives in San Francisco in November 1852, having traveled there via Panama. After several concerts in San Francisco, she travels to the gold fields and sings concerts for the diggers, many of whom are Irish. She is a sensation, so much so that tickets to her concerts are put up for auction by Bushnell and individuals bid as high as $1100 for a choice seat. She later traveled to Lima, Peru where she sang with a visiting Italian opera troupe after which she went on to Santiago in Chile for concerts. Her mother, Bushnell and others travel with her. She returned to San Francisco many months later to give more performances. Throughout these years Catherine Hayes always included the songs of Thomas Moore in her concerts along with operatic arias. However, it was the song, Kathleen Mavourneen by Frederick Crouch that became her signature piece. Her arrival in Sydney in September 1854 was heralded with great emotion. She was the first important European opera star to visit the remote colony. Over the next two years she sang in opera and concerts in Sydney, Melbourne, and Adelaide before traveling to Calcutta in India, where she entertained members of the British Army (many of whom were Irish) and their wives. She next went to Singapore and Java. Returning in June 1855 to Melbourne and Sydney she continued with more performances. She also visited the gold fields in Bendigo before going on to Tasmania for more concerts. In August 1856 Catherine returns to Britain, a very rich woman of 38 years having traveled around the world in pursuit of her career. She was accompanied by her mother and William A. Bushnell, her manager. Later in the year she completed a concert tour of Britain and Ireland, after which she appeared in opera in Dublin, Limerick and Cork. She and Bushnell married in October 1857 in the fashionable, St. George’s Church in Hanover Square, London, with her sister, mother and the Osbornes present. A year later Bushnell died while they are in Biarritz, France. Catherine eventually went back to singing. For the next two years she did a concert tour of Britain and Ireland. In August 1861 she suffered a stroke and died a few days later at the age of 42. Her mother and sister were at her bedside. She is buried in Kensal Green Cemetery in London. Catherine Hayes’ career was remarkable in many ways. She was not only the first Irish woman to become famous as an opera singer but she in effect became Ireland’s first Ambassador as everywhere she went around the world in the mid 19th century she sang Irish songs as part of her concert programs. The critics in Milan, Rome, London, Dublin, Belfast and throughout America, Canada and Australia loved her. She rarely received a bad review. On hearing of her death newspapers in Italy, Britain, Ireland, America and Australia ran extensive obituaries about her great loss. Unfortunately there are no recordings of Catherine Hayes’ voice as she lived long before recordings were first invented in the 1890’s. Another Limerick born soprano Suzanne Murphy of the 20th century has recorded some of the songs that Catherine Hayes sang, including, Kathleen Mavourneen and The Last Rose of Summer along with 18 other classical Irish songs. There is an Isle – Suzanne Murphy, soprano – CD(1) 00000? and 14 other songs and arias recorded in 1905 – when Patti was 62 years old. This is a very “primitative” recording.